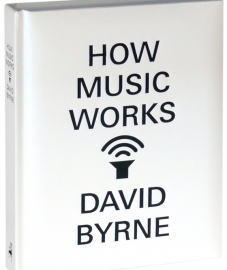 In this book, the former Talking-Heads frontman reflects on what he’s learned from a lifetime as a musician, record label owner and fan. Happily, it’s not a celebrity memoir, but a wide-ranging tome covering everything from his thoughts on the ways architectural history influenced the development of musical styles, to musings on technological changes, to analysis of changing business models. And unlike some veteran rockers who opine about the musical marketplace, Byrne is quick to note that his fanbase, built with older models, gives him a head start on the new models–a privilege emerging artists don’t have. Perhaps most surprising is Byrne’s pitch for expanded government & private support for youth arts centers in local communities. In all, it’s a wild ride with plenty of entertaining detours along the way. Like many young people, Chris Ruen downloaded music illegally without much thought until he learned many of his favorite “successful” indie artists were making less than he did working as a barista. That simple insight eventually led Ruen to this book, which makes a compelling case for a revived debate that moves past old arguments about Metallica and RIAA lawsuits. Unlike some leading pro-IP writers, Ruen takes a moderate, pragmatic approach, favoring shorter copyright terms, and acknowledging the many flaws of SOPA. Most crucially, Ruen devotes the middle third of his book talking to people whose voices have been all too absent from these debates: working musicians, independent labels and DIY promoters. Freeloading provides a thoughtful, important counterargument to thinkers like Lawrence Lessig and Cory Doctorow who espouse ideals of openness but perhaps haven’t fully reckoned with the financial impacts on working artists. If you’ve never experienced go-go music, the jubilant conga-and-timbale-infused funk variant that emerged from Washington DC in the 70s and flourished in the 1980s—well, you’re not alone. The genre, still widely unknown outside the DMV, has given voice to DC’s black community, and Hopkinson tells a compelling tale that goes beyond a simple genre history to explore questions of race, community and urban policy. It features an entertaining cast of characters too—most notably the late Chuck Brown. All You Need To Know About the Music Business by Donald S. Passman (Free Press). This trusted reference work has been released in a new, fully updated edition, and helpfully unpacks complicated legal concepts and standard industry practices. As a high-powered music industry lawyer, it’s understandable that Passman’s context is heavy on the big money deals associated with major labels. (Look elsewhere if you want to learn about how many indie labels use the standard 50/50 artist-label split, for example.) But it’s as comprehensive as it gets, and a worthwhile resource for any working musician. This lovingly-written history of Calvin Johnson’s mega-influential independent record label helpfully unpacks the DIY ideals that launched a movement 30+ years ago. It also illustrates the important role that indie record labels continue to play beyond funding and promoting emerging artists to elevating, defining the contours of new musical movements, building authentic community, and providing a platform for historically marginalized voices. In a context where even independent music seems increasingly fixated on Youtube superstardom, giant festivals, and ad placements, it’s good to be reminded that some of the best and most radical things happening in music making can be intimate, personal, and small-scale. Florida’s original verision of this book was a controversial landmark, launching important conversations about the relationships between musicians, artists, designers, and regional economic development. Suddenly, it seemed every ambitious city wanted to be a magnet for creative workers. Today, as communities struggle to recover from a recession, Florida argues that the creative class are more important than ever—and that “creative cities” have weathered the recession better than cities built solely on more traditional manufacturing and service industries. This new updated edition addresses major critics, and updates the work with qualitative and quantitative data that’s been gathered since its original publication. As conversations continue between arts and music leaders and urban planners nationwide, Florida’s work remains an important touchstone. Alvin Lucier, in addition to being a groundbreaking composer of experimental music, is also a professor at Wesleyan University, and if this book is any indication, he is a uniquely gifted educator. At 82 years old, he’s sharing this book which compiles the best of his teaching on experimental music from the 1950s onward, with the kind of deep insight and fascinating personal stories that could only come from someone who lived through it. Lucier tracks the advance of music technology and the development of new musical vocabularies, and his prose is welcoming and engaging, giving anyone–regardless of their prior knowledge or music theory background–a window into music that is often regarded as difficult, inaccessible, and academic. Need another last-minute gift idea? Consider making a donation to FMC!